List of Village Voice Initiatives. This List shows some of the initiatives that have come about in the parish either directly or indirectly as a result of work to develop the Parish Plan. Following adoption by the Parish Council (PC) of a Draft Parish Plan two Public Consultation meetings were held in the Village Hall on Saturday 16 March at 2.00 pm, and Thursday, 21 March at 7.30 pm. Read all about these meetings HERE. The Plan was updated to take into comments received at the meetings and re-submitted to the PC at their meeting on 11 Apr 2019. This version (see above) was adopted with the understanding that it would continue to be reviewed and updated as required. 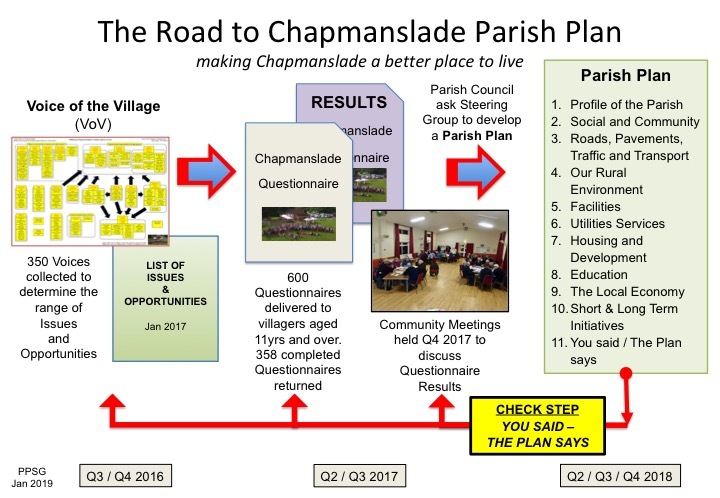 This webpage records the journey taken by the community over the period Q3 2016 to Q1 2019 to develop a Parish Plan based on the views of parishioners with the purpose of making Chapmanslade an even better place to live, work, play and visit over the coming years. The journey is described in detail in the following sections and represented in the diagram below. The journey started with the Parish Council (PC) recognizing the need to take a more proactive approach to their work. An initial Steering Group was established to map out the process of developing the most appropriate type of plan – which turned out to be a Parish Plan. A revised Steering Group took on the job of bringing the Parish Plan to fruition. Along the way the majority of parishioners were consulted in several ways and volunteers delivered a number of significant community initiatives. The last plan for Chapmanslade was set out more than 12 years ago and given the title CHAPCAP (Chapmanslade Community Action Plan). It resulted in many positive initiatives around the village, for example; the children’s playground, a youth club, Speed Watch, tree and hedge planting, Neighbourhood Watch, and recycling. The main reason CHAPCAP was so successful was because a wide cross section of the village was involved in generating ideas and volunteering their time. This approach has been followed when developing the Parish Plan, with the name ‘VILLAGE VOICE’ emerging as the preferred way of referring to the overall initiative. 1. Use the QUICK LINKS at the top of this document to view essential materials. Additional links are given in the text. 2. As the Parish Plan continues to develop, this webpage will be updated accordingly. In September 2016, Parish Councilors Adam Oakley and Phil Holihead took on the task of producing a ‘New Plan for Chapmanslade’ – reporting to the PC. It soon became clear that much had changed over the years since CHAPCAP, not only in the parish itself, but also in neighbouring towns and with local government structures and legislation. Initial investigation identified three possible types of Plan as outlined below. The following Steps were established. Each Step was cross-referenced to the equivalent Step number of the ‘Neighbourhood Planning Process NPP) Step-by-Step Guide’ on the Wiltshire Council ‘My Community’ website. Ref. Step No’s in [ ]. From the outset he Parish Council determined that the Plan should cover the whole of the Chapmanslade Parish as defined by Wiltshire County Council. Prof. Nigel Brown and Phil Jefferson (ex leader of the Parish Council) advised the Steering Team, especially in relation to the Village Questionnaire. To collect and collate the views from across the village on what activities should be considered in order to help inform decisions and actions that seek to make Chapmanslade a better placed to live for all residents. This statement put the work of the Steering Group firmly in the collect-and-collate space initially, specifically not stating that the group should make decisions or take actions themselves. The words all residents were included to ensure that the group was not seen as having self-interest, e.g. pushing their own agenda. The Steering Group developed and kept up to date a set of the Working Guidelines, the intention of which was to support and inform their work. The Guidelines gave a framework for ways of working and helped the group develop a cohesive common language. They were also used to integrate new members into the Steering Group. The Steering Group received advice and guidance from Community First Wiltshire (http://www.communityfirst.org.uk) using face-to-face and telephone meetings and emails. Starting 17 October 2016, regular SG meetings were held. The meetings were widely advertised and open to all villagers. Minutes of all meetings were recorded and placed on the village website for all to read. The main issue for the Steering Group when involving the community was to develop a strategy and a plan that reached out to as wide a cross-section of the community as possible. This would help to generate a wide variety of ideas and help in the implementation of the resulting actions throughout the community. STEP 1: Understand the ‘Voice of the Village’ by reaching out to all parts of the community asking for their suggestions / issues / opportunities for making Chapmanslade a better place to live, play and work. STEP 2: Analyse the resulting Voice of the Village (VoV) inputs using language-processing (LP) techniques. STEP 3: Use the Voice of the Village analysis to develop a detailed Questionnaire to be delivered to all households in the village. STEP 4: Communicate the Voice of the Village inputs and the Questionnaire Results to the community to help solicit volunteers for implementing ‘Village Voice Initiatives’. The Steering Group understood the importance of developing effective questions to ask of the community. Questions should be ‘open-ended’ NOT ‘closed’ (which can be answered by a simple ‘Yes’ or ‘No”). Open-ended questions require more thought from those being interviewed or surveyed, and help the interviewer to enter into a conversation from which useful information can be extracted. Q1. In your opinion, what are the issues and opportunities facing our community? Q2. What can the community do to help your group / club / business / organisation to be sustainable and be successful? Q3. When thinking of your group / business / organisation, are you planning to make, or do you know of, any significant changes? The Steering Group identified the various individuals and groups in the village who could/should be engaged, then ‘brainstormed’ ways in which engagement could take place. This information was contained in an Engagement Plan. The first community consultation meeting took place in the Village Hall at 7.30PM on 29 September 2016. All villagers were invited to the meeting via a leaflet drop, emails, and advertising on the village website. 25 people attended. Adam Oakley gave a presentation, followed by small group discussions, then attendees were asked to write down their issues and opportunities on Post-it Notes, which were grouped into topic headings. A spokesperson for each group shared the issues that arose with the whole meeting. No attempt was made to ask attendees to categorise or group their issues into any pre-determined or pre-prescribed buckets (e.g. housing, roads, transport, council services, sport/recreation, etc.). The strategy was to let the data (language data) shape the way forward. A total of 110 Post-it Note labels (Voices) were collected during the meeting. When duplicates were discarded, 75 issues / opportunities were left. After the meeting a Voice of the Village diagram was developed. Many forms of communication were used to feedback the results of the meeting – not only to the meeting attendees but also to as many villagers as possible (via emails, large display in the pub, at group meetings and on the village website). The ‘Voice of the Village’ diagram and the presentation used for the first meeting can be found on the village website. The Steering Group continued to involve and communicate with the community using the Community Engagement Plan as a template. Information regularly posted on the village Facebook page. Large sized VoV display board in the Three Horseshoes along with cards on tables asking for people’s inputs. Articles placed in the November and December 2016, and January 2017 issues of The Bridge magazine, which is delivered to all households. A total of 312 issues and opportunities were submitted up to 5 Jan 2017. The list of VoV Issues and Opportunities can be viewed on the village website. An important part of the Community Involvement Strategy was to use the ‘Voice of the Village’ analysis to help develop a detailed Questionnaire to be delivered to all residents over the age of 11. In addition, advice was sought from Community First as there are various guidelines that need to be followed should the Parish Council wish to use the results of the questionnaire to seek funding from Wiltshire Council and/or to develop a Parish or Neighbourhood Plan. Find Guidance Notes for developing a Questionnaire on the Wiltshire Council website. Chapmanslade resident Prof. Nigel Brown advised the Steering Group on the structure and wording of the questionnaire and local business sponsors (see back page of the Questionnaire) funded printing costs. The Parish Council agreed the final revision of the Questionnaire in June 2017. During June and early July 2017, a team of 20 volunteers distributed over 600 Questionnaires, plus a Demographics Sheet to each household. A total of 358 completed questionnaires (60% of those distributed) were collected, with at least one Questionnaire from just about every household in the village. Thereafter, all data were entered into an excel spreadsheet and a RESULTS REPORT produced. View the Questionnaire and the Results Report. Following issue of the Results Report, two face-to-face Engagement Meetings were held on 16 and 19 November to share and discuss the results of the Questionnaire. Over 50 parishioners joined these meetings. Both meetings were held in the Village Hall with parish councillors leading discussion groups. Notes from both meetings are available on the website. 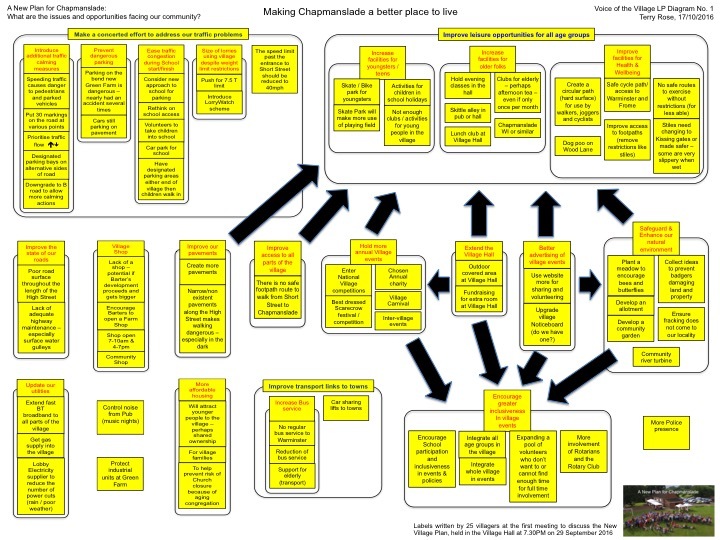 Following a detailed review of the Questionnaire Results and community consultation, the Parish Council asked the Steering Group to generate a PARISH PLAN (see Plan Options above) as they believed that this type of plan would achieve the best outcome of making Chapmanslade a better place to live, work, play and visit. The original Steering Group established in STEP 1 was reformed to develop the Parish Plan. As work progressed on developing the Parish Plan it was important for the SG to continually check alignment with the results of the Voice of the Village. See the graphic in Appendix 2. The SG used a format aligned to the section headings of the Questionnaire. The Parish Plan will include a series of short and longer-term initiatives to be carried out by volunteer groups – with progress being monitored by the Parish Council. An initiative is seen as any activity happening around the village that is designed to help make Chapmanslade a better place to live, work, play and visit. They may range in scope and difficulty from (say) something that is relatively quick to implement (the so-called low hanging fruit), to much larger, longer-term projects requiring significant planning, effort, funding, and community/local authority approval. Initiatives are not the responsibility of, nor owned by, the Steering Group. The SG may support individuals to establish initiatives for the benefit of the community. As villagers, SG members may wish to get involved in one or more initiatives. Not all initiatives take place as a direct result of, or even in connection with, the Parish Plan or Village Voice. It is hoped that individuals will be inspired by the work of the Steering Group and other volunteers and embrace their own initiatives. A List of Initiatives can be found on the website. The list is not comprehensive. The overall aim of the Parish Plan shall be to ‘Make Chapmanslade a better to LIVE, WORK, PLAY and VISIT. Achievements and results should be reported back to residents and the Parish Council on a regular basis. Get a wide cross section of the village involved – both in giving their views and implementing resulting actions. By its very location, Chapmanslade is not an insular or inward looking community – never has been. Ensure that the views of welcomed visitors and neighbouring communities are known. Wherever possible involve and bring on board established local groups, clubs and societies. Communicate, communicate, communicate – with residents and the outside world. Document what we do as we go along. Records of decisions, processes and results may be invaluable to gain funding and to produce the most appropriate type of plan. Act quickly on ‘low hanging fruit’ concerns / issues / suggestions. Don’t wait to produce a definite plan. ‘Voice of the Village’ is the preferred terminology for capturing the results of consulting villager’s issues and expectations/aspirations. Village Voice is the umbrella terminology for initiatives associated with the Parish Plan.